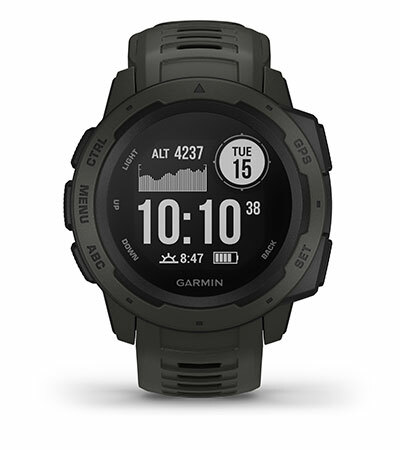 This rugged outdoor GPS watch has what it takes with reliable navigation features, tough military standard tested casing and enduring battery life. The Instinct is tough thanks to a fibre-reinforced polymer case and the scratch resistant display with high contrast allows it to be perfectly readable in any lighting condition. GPS, GLONASS and Galileo positioning empowers you to confidently navigate outdoors and just in case you get lost, you can use the TracBack feature to safely navigate back to your starting point. Take your training to the next level with preloaded activity profiles such as running, biking, swimming and more, all whilst monitoring your heart rate with Elevate wrist heart rate all day. Smart notifications on your wrist, keeps you connected to what matters most whilst you are on the go. You've never been one to follow the beaten path ó that's where Instinct comes in. GPS, GLONASS and Galileo satellite network capability tracks in more challenging environments than GPS alone. 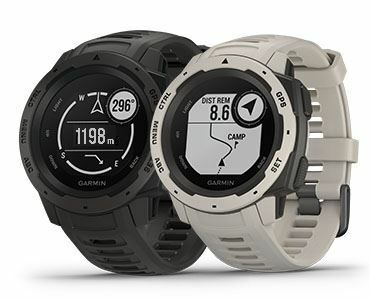 The built-in 3-axis compass and barometric altimeter help you keep your bearings. Take the guesswork out of your return journey by using the TracBack feature to navigate the same route back to the start. The Instinct GPS watch monitors your heart rate, activity and stress throughout the day, so you know how much you do ó and how hard you're working to do it. When you're ready to train, we've got you covered with preloaded activity profiles for running, biking, swimming and more. Smart notifications let you leave your phone in your pocket. Pair your phone with Instinct and Garmin Connect online fitness community for automatic uploads, live tracking and the GroupTrack feature. 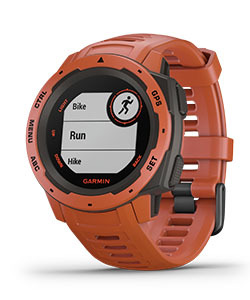 Pair with the Garmin Explore website and app to plan adventures before you head out.